Not to be confused with McMahon Ministry. 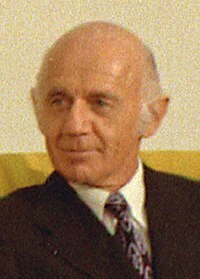 The McMahon Government was the period of federal executive government of Australia led by Prime Minister William McMahon of the Liberal Party. It was made up of members of a coalition between the Liberal Party and the Country Party, led by Doug Anthony as Deputy Prime Minister. The McMahon Government lasted from March 1971 to December 1972, being defeated at the 1972 federal election. Writing for the Australian Dictionary of Biography, Julian Leeser describes McMahon's prime ministership as "a blend of cautious innovation and fundamental orthodoxy". John Gorton became Prime Minister of Australia on 10 January 1968. He was chosen to lead the Liberal Party in place of Harold Holt, who had drowned in rough surf off the Victorian coast. William McMahon was then serving as Deputy Leader of the Liberal Party, but Country Party leader John McEwen ruled out maintaining the Coalition if McMahon became Prime Minister. McMahon as Treasurer had resisted McEwen's support for high levels of protection for manufacturing. Defence and Australia's commitment to the Vietnam War was a prominent issue during the term of the Gorton Government; funding for the arts was expanded, rates of pay were standardised between the men and women and the mining industry grew during the period. A policy of economic centralisation led to friction with State leaders and difficulties within the coalition. Gorton departed the office of Prime Minister on 10 March 1971 after a tied Liberal party room vote of confidence in his leadership. The Liberal-Country Party Coalition had been in office continually since 1949. In April 1967, Gough Whitlam replaced Arthur Calwell as leader of the Labor Party and Leader of the Opposition. Labor reduced the Gorton Government's majority and came within four seats of government at the 1969 election; McMahon unsuccessfully challenged Gorton for the leadership in the aftermath. The government also performed poorly in the 1970 half-Senate election, adding to pressures on Gorton's leadership. Defence minister Malcolm Fraser developed an uneasy relationship with Gorton and in early 1971, Fraser accused Gorton of being disloyal to him in a conflict with Army officials over progress in South Vietnam. On 8 March 1971, Fraser resigned and announced in parliament the following day that Gorton was "not fit to hold the great office of Prime Minister". On 10 March, the Liberal party room moved to debate and vote on a motion of confidence in Gorton as party leader, resulting in a 33–33 tie. In response Gorton said ‘that is not a vote of confidence’ and resigned as leader. By this time John McEwen had dropped his veto of McMahon. McMahon replaced Gorton as Prime Minister. Gorton was elected deputy leader. His relations with Fraser did not recover. William McMahon had joined the Parliament in 1949 and by 1951 had been promoted to Minister for the Navy and for the Air. He had served as a major during the Second World War, and worked on home defence. He served as Minister for Primary Industry (1956–58) and Minister for Labour and National Service (1958–66) in the Menzies Government, then as Treasurer (1966–69) in the Holt Government and Gorton Government, and finally as Minister for External Affairs (1969–71) in the Gorton government. He was married to Sonia McMahon, who maintained a high public profile. Deputy Prime Minister and Leader of the Country Party, Doug Anthony. William "Bill" McMahon became Prime Minister of Australia on 10 March 1971, at the age of 63. The McMahon Ministry was sworn in by Governor-General Paul Hasluck with Country Party leader Doug Anthony as Deputy Prime Minister. McMahon moved Gorton's Treasurer, Leslie Bury to the Ministry for External Affairs and installed Billy Snedden as Treasurer. United States President Richard Nixon with Prime Minister McMahon at the White House in 1971. Disunity continued to affect the Government, following the replacement of Gorton. Gorton had taken the senior Cabinet position of Minister for Defence but was forced to resign from Cabinet in August 1971, after McMahon accused him of breaching Cabinet solidarity. McMahon maintained Australia's diminishing commitment to Vietnam and criticised Opposition leader, Gough Whitlam, for visiting Communist China in 1972 – only to have the US President Richard Nixon announce a planned visit soon after. Anticipating a US withdrawal, the McMahon Government announced an 'accelerated withdrawal' of Australian troops in Vietnam in July 1971. Bill Wentworth occupied the new post of Minister for Aboriginal Affairs. During McMahon's period in office, Neville Bonner joined the Senate and became the first Indigenous Australian in the Australian Parliament. Bonner was chosen by the Liberal Party to fill a Senate vacancy in 1971 and celebrated his maiden parliamentary speech with a boomerang throwing display on the lawns of Parliament. Bonner went on to win election at the 1972 election and served as a Liberal Senator for 12 years. He worked on Indigenous and social welfare issues and proved an independent minded Senator, often crossing the floor on Parliamentary votes. Land Rights were a topical issue during the term of the McMahon Government and in 1972, Aboriginal protestors set up a Tent Embassy on the lawns in front of Parliament House. The government accepted the recommendations of the Gibb committee on Aboriginal employment, which included the lease of land at Wattie Creek to the Gurindji people, who had been staging a strike on a section of the Vestey company lease since 1966. As the 1972 election approached, inflation and unemployment were increasing and the world economy was entering the 1970s decline. In 1971, the Government delivered a deflationary budget in response to economic conditions- but in 1972, faced with the challenge of Gough Whitlam's vast program of expenditure, Treasurer Snedden delivered a more election-friendly high spending budget. The McMahon Government ended when Gough Whitlam led the Australian Labor Party out of its 23-year period in Opposition at 2 December 1972 election. The charismatic Whitlam led an effective campaign that resulted in Labor securing 67 seats to the Coalition's 58, leaving McMahon as the first non-Labor leader to suffer an election defeat since 1946. McMahon did not recontest the leadership of the Liberal Party and became a backbencher. Several candidates ran for the party leadership, including John Gorton, but the party settled on Billy Snedden with Phillip Lynch as Deputy. McMahon remained in the parliament as a backbencher for 10 years after losing office as Prime Minister. He retired in 1982. Snedden led the Coalition to the 1974 Election. Malcolm Fraser became leader of the Liberals and led the Coalition to a landslide victory against Gough Whitlam's Labor Party, following the 1975 Dismissal of the Whitlam Government. This page was last edited on 6 January 2019, at 09:53 (UTC).